My Vacation Lady had the opportunity to visit Costa Rica a couple of times. The first was with a travel agent group in July 2012. This trip really opened our eyes to the natural beauty and diversity of this small country. Within 1 week, we stayed in 4 different areas of the country from the Cloud Forest to the Arenal Volcano area to the Manual Antonio area and ending up in Jaco. Each was so different and each had so many unique qualities that our one week trip could have easily been turned into 2 weeks or more and we still wouldn’t have explored and experienced all that Costa Rica has to offer. The 2nd trip was more recently, in December 2015, when we vacationed in the Guanacaste (Pacific Northwest area) at 2 different resorts– 1 was all inclusive and the other was not. One of the interesting things we found out was about the Costa Rican people. When a visitor to their country says thank you or gracias, the Costa Ricans don’t simply answer you’re welcome or de nada, they responded, “con mucho gusto” or with my pleasure. For those of us who have traveled throughout the Caribbean and Mexico, those words were surprising and those speaking it, truly meant them. Costa Rica is a nation that cares about the environment and the preservation of nature and many resorts we visited were proud of their CST (Certified Sustainable Tourism) Certification. This is a county where 25 % of their land is preserved national parks. It will likely never be a country with high rise hotels stacked one after another bordering the beach. Is Costa Rica the right destination for you? If you are looking for a beach destination– Costa Rica is one of the few countries where you can take a dip in 2 oceans in the same day. The Caribbean Sea is just a 5 hour drive from the Pacific Ocean. With everything from black sand beaches to beautiful light sand beaches on the Pacific Coast, Costa Rica is not your typical beach destination. It is much more than just beaches. If you are looking for a vacation where all you want to do is lay on the beach with a drink in your hand, Costa Rica may not be the right destination for you. 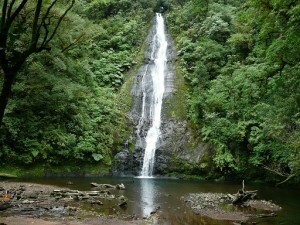 Visiting Costa Rica is more about exploring the country and the different experiences you can have on your vacation. 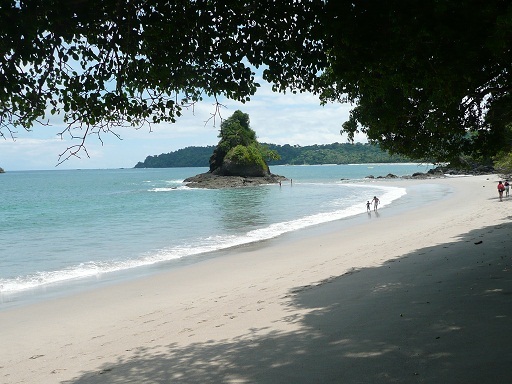 Manuel Antonio is just a short flight from San Jose or a 3.5 hour drive and the boutique hotels in this lovely Pacific resort area provide access to the Manual Antonio National Park, a haven for spectacular white sand beaches and virgin forests. It would be considered to be part of the central Pacific region. Guanacaste offers miles of virtually untouched beaches on the pacific. You’ll also find some of the finest hotels, a few all inclusive resorts and best nature parks. Puntarenas is the closest beach area to San Jose and features striking and unusual black sand beaches. This is a great starting point for day trips to the Monteverde Cloud Forest or the Arenal Volcano. 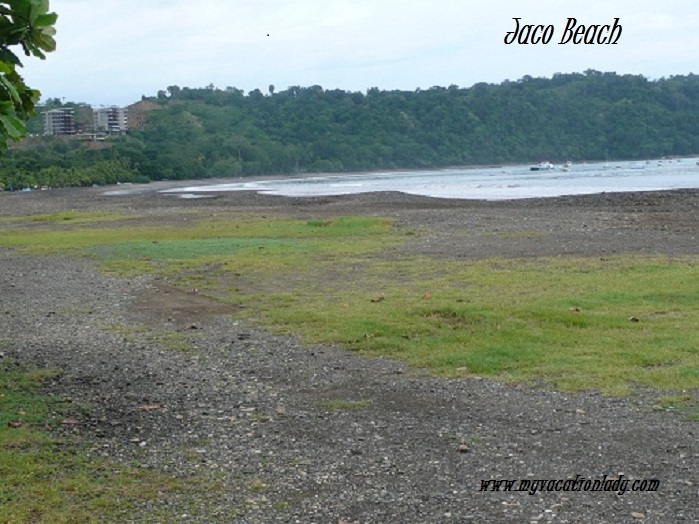 Jaco Beach is renowned for surfing. With small native style hotels, as well as a Marriott, restaurants with local flair and low key entertainment, this area is an ideal base for exploring the Carara Biological Reserve. What is there to see and do and experience in Costa Rica? 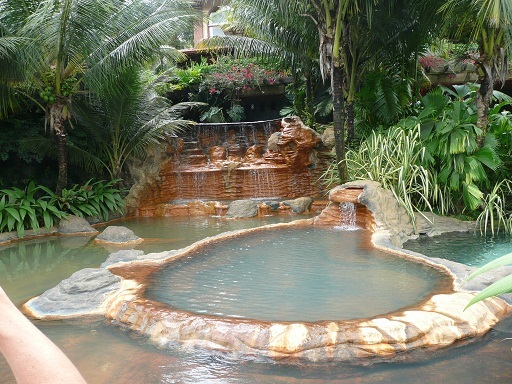 Hot Springs at Arenal – Naturally heated by the Arenal Volcano, the heated water of the river is channeled into soothing pools surrounded by manicured gardens. One of the first and still the most popular resort to find the hot springs is Tabacon but most of the resorts have beautiful hot springs pools. The Springs is one of the newer resorts with absolutely beautiful hot springs pools surrounded by exotic gardens and lush tropical foliage. Zip lining- over some of the most gorgeous rain forest imaginable. This is not for the faint of heart. Hiking- we saw waterfalls, babbling streams, butterflies, birds, iguanas, insects, gorgeous plants and wildlife, including monkeys. Horseback riding- this was not a trail that you would likely find back home. We went through small rivers, up and down hills, rode on river rocks and through the jungle. Rafting- you can do white water rafting (levels 1-5 are available) or for the less adventurous, we took a safari float trip where wildlife was abundant. Rappelling- climb yourself up the side of a cliff and under a water fall. Fishing- some of the best deep sea fishing is off the Pacific Coast of Costa Rica for tuna, blue marlin, grouper, snapper, sailfish and more. Fresh water fishing is available in the central valleys. Surfing- Jaco has some of the best surfing beaches in the Western Hemisphere. Scuba Diving or Snorkeling-you can see soft and hard coral formations and an abundance of tropical fish. Don’t be surprised if you run into a sea turtle. ATV tours and mountain biking are a great way to see wildlife. Bird watching, whale watching, crocodile watching, iguana watching and butterfly watching. 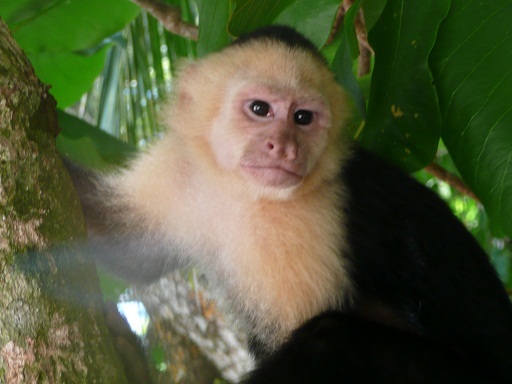 You don’t have to look far to see wildlife in Costa Rica. Golf – with a dozen or more world class courses designed by names like Greg Norman, Robert Trent-Jones III, and Jack Nicholas- in the middle of rainforests. Costa Rica is a great golf destination because it combines beautiful landscapes, great year round weather and challenging world class courses. 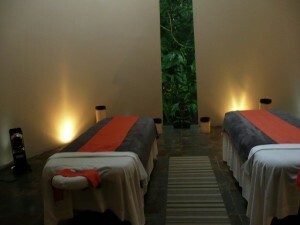 Spa- with so many of us working harder than ever, spas are more and more popular in the resorts of Costa Rica. Our 15 suite resort in the Cloud Forest, had a wonderful spa that was accessed by a hanging bridge. After a day of ziplining or hiking, what could be more relaxing than a spa treatment? On your honeymoon or romantic vacation, couples massages are available at many of the resorts, as well. 5 star hotels to boutique hotels to jungle lodges. There are over 1600 hotel options and 80% of the hotels have less than 40 rooms. We stayed at 4 different resorts during our 7 night travel agent trip and visited a dozen more and each was completely different and unique in its on way. Our hotel in the Cloud Forest, had only 15 suites with hot tubs on the decks and with views of the mountains surrounding the property. In the Arenal area, we saw a resort which would be an adventure lover’s dream full of hot springs pools, waterfalls, waterslides, a river for rafting and kayaking and its own big cat reserve. In Manual Antonio, we saw resorts with less than 50 rooms and suites built into the hillside overlooking the white sandy beach. One was featured on the Bachelor and made the Manual Antonio region even more popular. In Jaco, the surfing capital of Costa Rica, our resort had its own golf course and one of the largest pools in Costa Rica. This resort bordered a black sand beach. During our Guanacaste vacation, in 2015, we stayed at 2 resorts and visited 5 others. Four of these resorts were all inclusive (including one adult only all inclusive resort). We stayed at 1 boutique, upscale resort and visited another that would be perfect for honeymoons or a quiet getaway. The last we saw is a beautiful resort, with 2 white sand beaches, room and suites that would be great for families or couples and sits next to a golf course. Costa Rica has a hotel that will fit every need and preference. From the mountain lodges nestled among the lush rainforest, to the boutique hotels with private jacuzzis or plunge pools to the large all inclusive resorts in the Guanacaste area and big city hotels in San Jose, there is something to fit every travel style and budget. All in a country that has no army, more school teachers than police, a friendly and educated population that speaks both Spanish and English. Costa Rica is located in Central America. It is about the size of West Virginia and is surrounded on the east by the Caribbean Sea and the Pacific Ocean on the west. There are 2 international airports in Costa Rica. One is just outside of the capital city of San Jose. 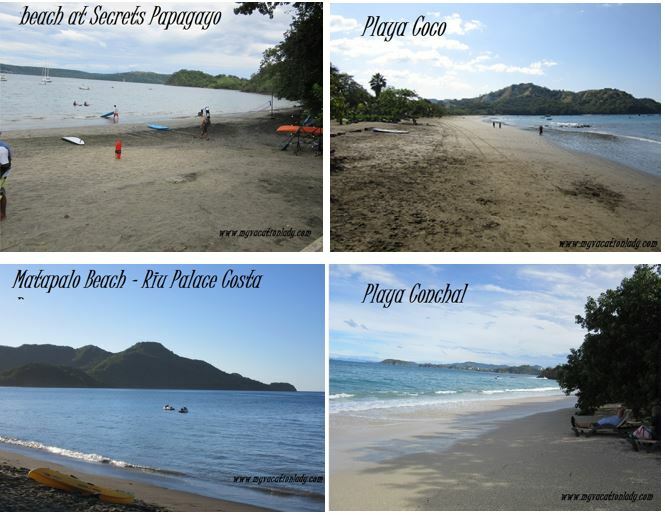 The other is in Liberia, in Guanacaste province, which is the gateway to the northwest beaches. A current passport is required by US citizens and must be valid for 6 months after the date of arrival. Costa Rica has a tropical climate with 2 seasons. The Dry Season runs from December to May. It is typically sunny with little rain. Average temperature will be in the 70’s in the central plateau and 80’s on the coast. The Green Season runs from June to November. There is typically higher humidity with sunny mornings and frequent afternoon rain showers. We visited in late July and while it was cool (70’s in the cloud forest), the heat and humidity was much higher in Arenal and even hotter in Manual Antonio. It did rain almost every day so be prepared with a rain poncho and be prepared to use it. Try the last 2 weeks of June for good weather with off season pricing! What else can you experience in Costa Rica? Mountains and Active Volcanoes – including Volcan Irazu, the highest volcano in Costa Rica. Only 45 minutes from San Jose, with 5 distinct craters. On a clear day, you can see both the Caribbean Sea and the Pacific Ocean from this majestic volcano. The most well known, Volcan Arenal, amazes visitors with a show of ash and fiery rock. The spectacle becomes even more dramatic at night. Popular activities in the mountain area would be biking, mountain climbing, birdwatching and hiking. Be prepared with hiking boots or sneakers with a good tread for walking, binoculars, a hat, sunscreen and insect repellent. 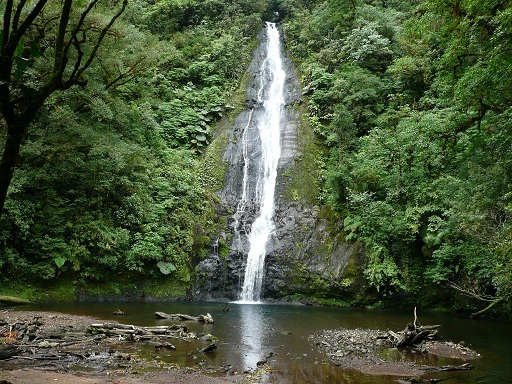 Tropical Forests – Did you know that there are 3 types of forests found in Costa Rica? Rainforest – found mostly in the Atlantic lowlands and southwest region. You’ll see massive trees, very high canopies and very little vegetation on the dimly lit forest floors. Cloud forests – Monteverde is the best known with dense, luxurious vegetation covering the upper slopes of the mountains and volcanoes. Dry forest – found in the northwest region. What can you do in the forests? Hiking through the national parks. Canopy tours let you travel through the tree tops from platform to platform supported by cables. Aerial tram-experience the canopy of the rainforest on an enclosed gondola ride. Suspension bridges and platforms- give you another prospective of the Monteverde cloud forest. Rivers and Lakes – boating, raft float trips, kayaking and white water rafting offer the chance to see lots of wildlife. Windsurfing – with trade winds blowing from December through March, Lake Arenal and the Gulf of Papagayo are ideal for windsurfing. Wildlife – Costa Rica is a birdwatchers paradise with over 850 species found throughout the country. In addition, over 14,000 species of butterflies, 4 species of monkeys, 8 species of turtles, 6 species of wildcats and numerous lizards and crocodiles call Costa Rica home. 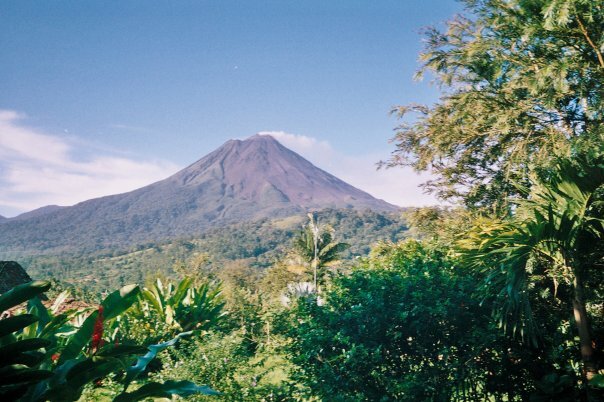 Arenal Volcano and Hot Springs tour by day or night. Reventazon White Water Rafting- start with relatively easy rapids and then progress to El Gordo and Huesco Santo, the most challenging rapids on the river. At the same time, enjoy the fabulous scenery and wide variety of wildlife. Aerial Tram Rainforest Tour- cross the Continental Divide and continue into the natural beauty of the Braulio Carrillo National Park. This open air tram will take you through the canopy, skimming over hilltops into the depths of the jungle. 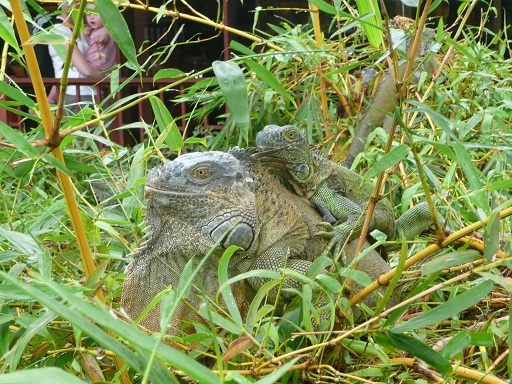 River Nature Cruise and Poas Volcano-gives you the opportunity to enjoy the spectacular hightlights in one day. After seeing the geyserlike eruptions of the active Poas Volcano, continue the journey on a cruise down the Sarapiaui River where you can enjoy the magnificent rainforest and its inhabitants. 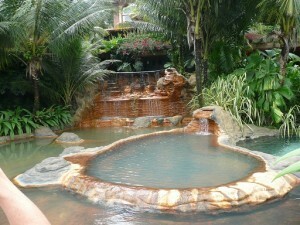 Costa Rica is so much more than just a beach destination- with 5 star nature and all of the comforts imaginable. Let My Vacation Lady help you decide which resorts and locations within the country would be the best for your vacation or honeymoon!